The 2019 Honda CRF450 has the most horsepower and torque—it just needs a more accurate and resilient chassis to harness it. 1. At 6000 rpm, the Kawasaki KX450 makes the most horsepower (37.68). However, the Honda (37.52) and KTM (37.47) are on a whisker behind. The Suzuki RM-Z450 makes the least horsepower at 6000 rpm (35.88). 2. At 8000 rpm the CRF450 takes over with an impressive (54.67) ahead of the KTM’s (53.92) and Husqvarna’s 52.92. The Kawasaki KX450 (52.18) and Suzuki RM-Z450 (52.14) are at the bottom of the chart. 3. 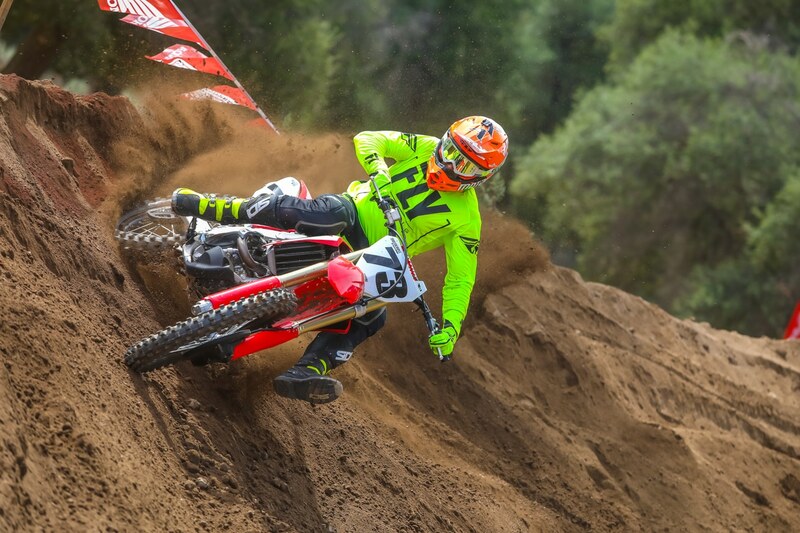 At 10,000 rpm, the Honda CRF450 stretches its “Most Horsepower” lead with an impressive 59.71 horsepower. Yamaha (57.18) is a solid second. KTM (55.85), Husqvarna (55.46) and Kawasaki (55.24) round out the top five. 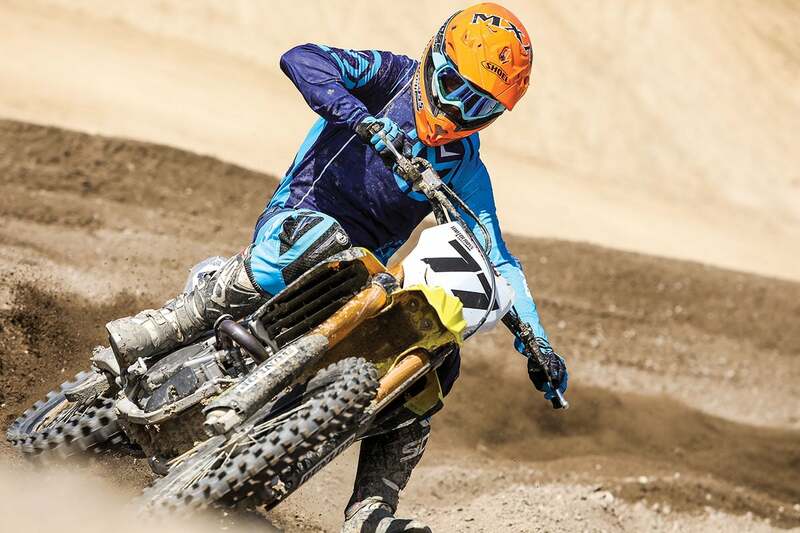 The Suzuki RM-Z450 peaked very early and is on the way down by 10,000 rpm at 50.86 horsepower. 4. Peak horsepower doesn’t always fall on an even number, but it is where the engine reaches its maximum number. The Honda CRF450 peaks at 60.21 horsepower and the remaining five engines fall off in half horsepower increments from 57.51 (Yamaha) to 57.14 (KTM), 56.40 (Husqvarna), 55.86 (Kawasaki) and 54.39 (Suzuki). Weight isn’t always about what you feel from the saddle but what the forks and shock feel on landings, the engine feels on acceleration, what the brakes feel when trying to slow down from speed and what the frame, spokes and rims feel when they hit the ground. In these cases, lighter is better. MXA weighs the bikes with the fuel tanks empty, this eliminates the variation caused by the different gas tank capacities. 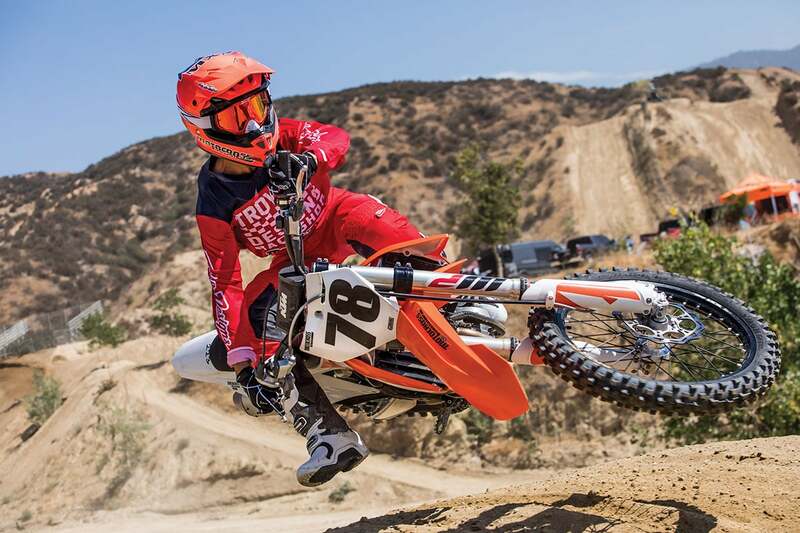 The KTM 450SXF is the lightest bike at 223 pounds. The almost identical Husqvarna FC450 is one pounds heavier (because of their heavier brake rotors, ice cream-cone muffler and plastic airbox/subframe). The Kawasaki KX450 weighs 10 pounds more than the KTM, but is the lightest Japanese bike by 5 pounds. The Yamaha YZ450F and Honda CRF450 at 15 pounds heavier than the KTM at 238 pounds. The Suzuki RM-Z450 is the heaviest bike at 241 pounds (18 pounds more than the lightest one). The Husqvarna FC450 is the most expensive bike, if you don’t count the KTM Factory Edition, Husqvarna Rockstar Edition or Honda CRF450 Works Edition. 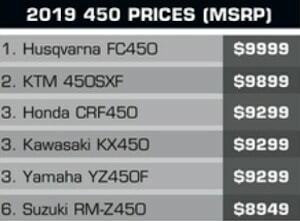 The 2019 Husqvarna FC450 retails for $9999, which is $100 more than the $9899 KTM 450SXF, $700 more than the $9299 Yamaha YZ450F and $9299 Honda CRF450. The Suzuki RM-Z450 is $1050 less than the Husqvarna. The Suzuki is the least expensive bike and the only one below the $9000 threshold at $8949. The Suzuki RM-Z450 didn’t lose every category, but when it lost, it lost big. The Honda CRF450 makes 36.25 lb/-ft of torque at 7500 rpm. The KTM 450SXF is second with 35.79 lb.-ft of torque at 6900 rpm. 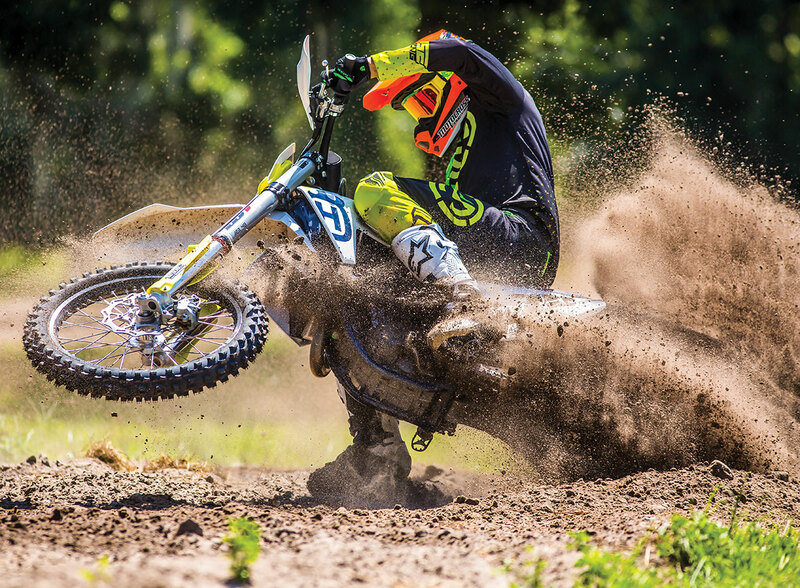 The Husqvarna FC450 is third with 35.31 lb.-ft of torque at 7100 rpm. 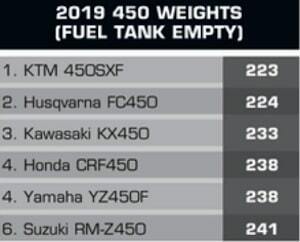 The Kawasaki KX450 and Suzuki RM-Z450 are tied for fourth with 34.85 lb.-ft of torque, but the KX450 makes it peak torque at a very high 8500 rpm, while the RM-Z450 does it best work at 6900 rpm. The 2019 Yamaha YZ450F makes the least torque at 34.30 lb.-ft at 6900 rpm.